During pregnancy, women need to make a number of dietary adjustments. Between eating more from certain food groups, limiting others and avoiding certain foods altogether, a pregnant woman with celiac might wonder where dining out gluten free fits into her pregnancy and whether she should approach it differently. While dining out is something that anyone with celiac gives a great deal of forethought to, it warrants special attention as it applies to pregnant woman. For a woman with celiac, the most dramatic adjustments when it comes to eating—whether at home or at a restaurant—result from pregnancy dietary guidelines. “I recall in early pregnancy feeling somewhat overwhelmed with additional considerations when eating out,” explains Iselin. “I’ve had celiac disease most of my life, so I’m very used to scouring menus and asking all the appropriate questions about ingredients and cross-contamination.” Eating out during pregnancy “meant additional considerations, like making sure the queso fresco in my Mexican food and the goat cheese in my beet salad were pasteurized” as well as “avoiding raw sprouts and high-mercury fish,” she says. Some fish should not be consumed during pregnancy. “Avoid king mackerel, swordfish, shark, marlin, tilefish [from the Gulf of Mexico], orange roughy and bigeye tuna,” Keller says. Make sure that fish is fully cooked before consuming. Avoid raw and undercooked fish altogether. 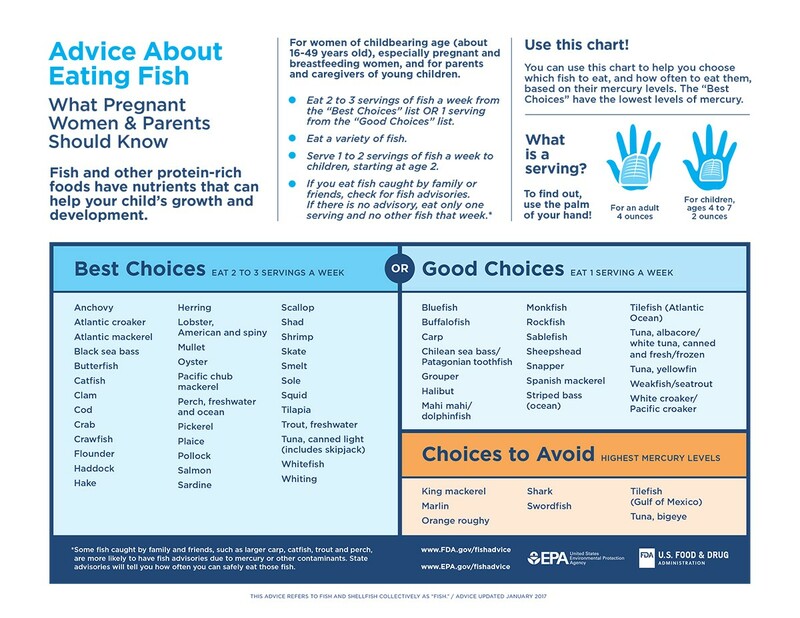 For those with any questions on eating fish during pregnancy, Keller recommends the U.S. Food and Drug Administration’s Advice About Eating Fish chart. During pregnancy, women should speak with their physician to ensure they are meeting both their pregnancy and individual nutritional needs.